﻿ Florida Snake Photograph 011 - This Pueblan Milk Snake is yet another non-native snake. 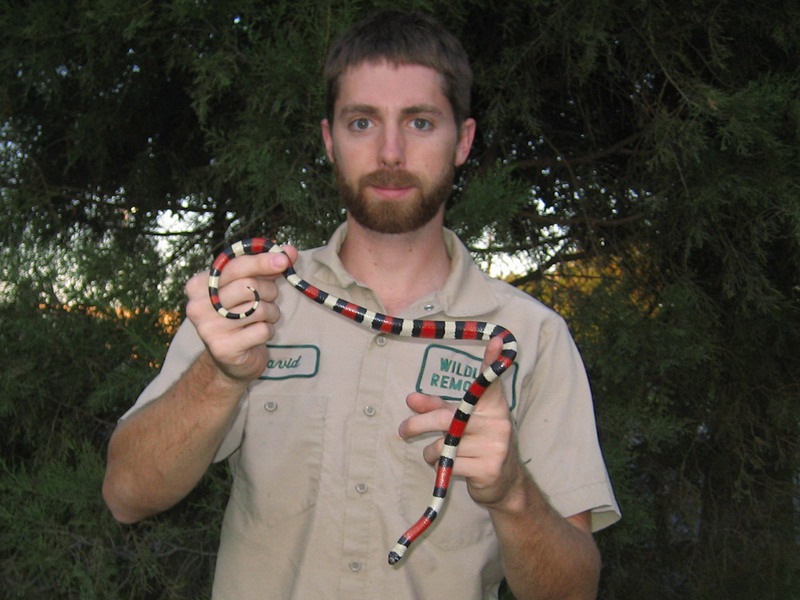 This Pueblan Milk Snake is yet another non-native snake. DESCRIPTION: A thin snake with a small head. It is black, red, and white. They come from Central America. Pueblan Milk Snake - Beauty on display - The reptile world is rich with several species of snake. There seems to be every kind of snake available: from large to small, fat to skinny, and poisonous to non-poisonous. With this wide variety comes a fascination with snakes, how they live, what they eat, and whether or not they can be successfully kept in captivity. The snake hobbyist may desire to keep and observe a species as beautiful as the multi-colored Coral snake. However the Coral snake is extremely poisonous and contains one of the most potent venom in the world. Obviously many implications arise when one chooses to hold a poisonous snake, such as the Coral, in captivity. There is not only the danger of getting bitten by one of these snakes, but there are also complications in care and storage that come into play. Therefore, very often this species cannot be effectively kept in captivity. Much to the relief of hobbyists everywhere, there is an alternative. The Pueblan Milk snake is equally as beautiful and is non-venomous. In addition, they are extremely easy to care for. These traits make them one of the most sought after species in the snake world. The Milk snake, while a nervous species, rarely bites. It can live an average of 12 years in captivity; although it has also been reported that they can live up to 20 years. Their small length (4 feet) makes them an excellent size for a 20 gallon aquarium, and their docile nature, makes them easy to handle. With proper temperature and lighting, water, sustenance (usually breeder mice or rats), and suitable environment (with a hiding place and appropriate bedding for the bottom of the cage), the Pueblan Milk snake can live a long and healthy life, and be a beautiful addition to your animal brood.